This easy recipe for shrimp pizza with bacon and red peppers is one of our all-time favorites. The flavors of slightly smoky bacon and sweet juicy shrimp blend perfectly - and best of all, you can put it together in 5 minutes or less. Although we often make this shrimp pizza with bacon recipe for fast and easy mid-week dinners, it's also a big hit at parties. We first tasted this delicious seafood pizza during a trip to Taiwan, and loved it. After we returned home to the U.S., we started trying to duplicate it. But . . . success did not come easily. First we tried using a white sauce as the base - ick! Next we tried a thin layer of cream cheese. Better, but still not great. Finally, the combination of a thin coating of olive oil topped with mozzarella and then layered with shrimp. pineapple, and a final sprinkling of a little more cheese and sea salt hit the mark. Happily, this combo is also the easiest to make. As a bonus, you can serve this pineapple and shrimp pizza recipe for lunch, as an appetizer, or for dinner - also great for parties! And, if you're lucky enough to have leftovers, reheat them the next day for a delicious breakfast. For baking, you'll need 2 16-inch pizza pans or baking sheets, sprayed with cooking oil. 1. Divide the pizza dough into 2 parts, roll out into 15-inch circles, and carefully place on the 2 pizza pans or baking sheets. If you're using the baking sheets, roll out the dough into square or irregular shapes for a more rustic effect. 2. Spread 2 tablespoons olive oil evenly across the dough for each pizza. Sprinkle 1/2 cup mozzarella across each pizza. 3. Divide the pineapple and shrimp into 2 portions, and distribute across the tops of the pizzas. Distribute the parmesan/romano cheese across the pizza tops. Sprinkle each pizza with the salt. 4. Bake about 10 minutes, until the crusts become light golden brown and the cheese in the the middle of the pizzas begins to bubble. Slide off the pans onto wire racks to cool for a couple of minutes before cutting into wedges or squares for serving. For a simple lunch or dinner, just add a green salad, and perhaps a cup of orange-colored soup, such as carrot, winter squash, or pumpkin. 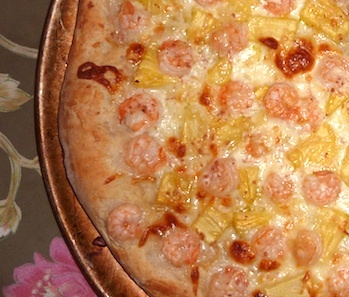 This shrimp pizza recipe will also be a huge hit at parties. Roll out the dough into large 15-inch squares, and bake on a cookie sheet. For easy serving, cut into small 2-inch squares and arrange on a platter.